The STRÅNG model system produces instantaneous fields of global radiation, photosynthetically active radiation, UV radiation (CIE weighted) and direct radiation at a horizontal resolution of about 2.5 x 2.5 km and a temporal resolution of one hour. Sunshine duration is available with daily resolution. The model covers the Nordic countries with a grid of size 630 x 779. 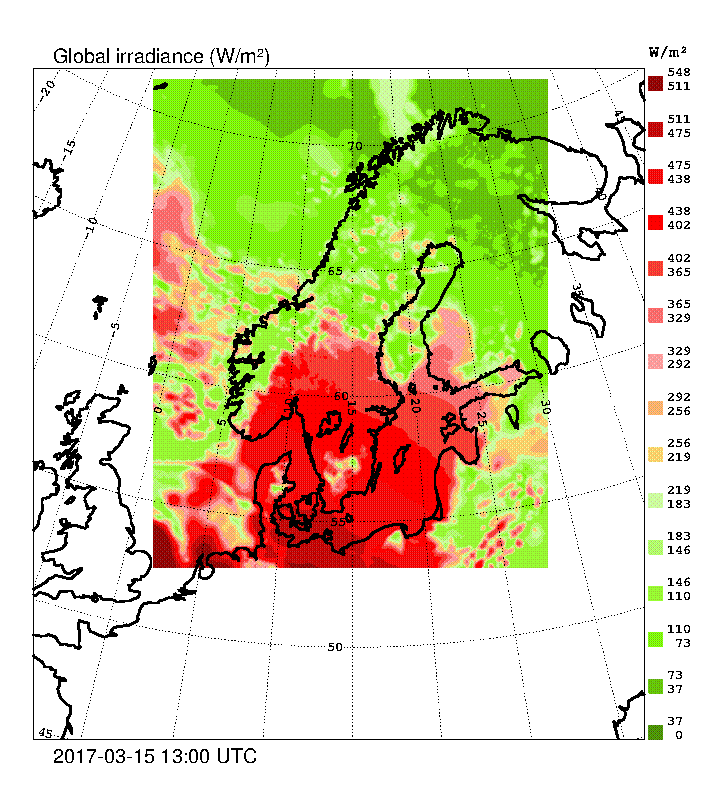 Information about direct solar radiation and global radiation from the radiation network of SMHI has been used for tuning and validation. The resolution and model area has changed during the years: between January 1999 and May 2006 the horizontal resolution was about 22 x 22 km. Then it changed to 11 x 11 km and from March 29 2017 it changed again and is now 2.5 x 2.5 km. Also, at this time the photosynthetically active radiation changed entity from PPFD in micro moles per square meter and second to irradiance in watts per square meter. The input and output fields that are produced by the system are adapted to the mesoscale analysis system at SMHI called MESAN. Input data also comes from the numerical weather prediction system at SMHI. It uses the AROME model within the HARMONIE script system coupled to the external SURFEX scheme, see the HIRLAM project for more informaton. Ozone fields are retrieved from the European Centre for Medium-Range Weather Forecasts (ECMWF). The model development was financed by SMHI, the Swedish Radiation Safety Authority (Strålsäkerhetsmyndigheten, SSM) and the Swedish Environmental Protection Agency (Naturvårdsverket). The STRÅNG model is run at SMHI with financial contributions from The Swedish Environment Protection Agency (Miljövervakningen). Extract historical (1999 - ) data from the STRÅNG system data base. The result can be returned as time series, data fields or charts. Click here for model validation figures.